We had left our big backpacks which had accompanied us loyally during the last 5 months, in Bogota. Thus, we boarded our plane to Cartagena de Indias, the ‘white’ city all backpackers go into rhapsodies about, only with hand luggage. Right at the airport we reunited with some friends that we had first met in Montañita and went on to look for a hostel in Getsemani, the city area where most backpackers stay, together. For the next couple of days we then explored the beautiful colonial style old town of Cartagena, walked on the city walls of the 11km long fortress once built to defend the city back in the day, cooled off by catching the waves at Bocagrande, the city’s best beach close by and spent our evenings sipping beers at the square close to the famous clock tower gate or munched ice cream (which was necessary, obviously because it was very hot still at night) while enjoying the atmosphere at a square we found where everybody can present his talent, be it singing, dancing or some kind of acting, to an attentive audience of locals and travelers mingled together. We sadly forgot to remember the name of the place, but if you walk around Getsemani at night, you will surely run into it. Our next stop then was Playa Blanca. Located just an hour’s drive outside the city (and accessible by boat, taxi or bus), this beach fulfills all criteria of a tropical paradise beach: white sand, turquoise water, palm trees, cocktails served in pineapples or coconuts and little huts to sleep in right on the beach. While there, we floundered about in the calm and bathtub warm water, went for strolls on the beach until we found our own little private strip where we watched the splendid sunset before walking back to eat some fresh Mojarra for dinner (this is a delicious local fish, however, you got to be sure to tell the server you want it grilled, otherwise they will just fry that fish to tastelessness). Many people just come here for a day trip, however, we wanted to spend the night, and thus, could choose between sleeping in hammocks or rooms, both of course so close to the sea that you could not only see but also hear it. As there are quite some mosquitoes around we opted for rooms, but as it stayed hot and humid during the night, we ended up taking a dip in the ocean in the middle of the night, trying to cool down. However, the water was not much cooler than the outside temperature and therefore, did not help all together that much to cool us off, but nevertheless, it still felt great. Before returning to Cartagena, we enjoyed another day at the beach, bringing our relaxation level up to at least 200%, possibly even higher. From Cartagena we took a transfer bus to go to Santa Marta. Santa Marta itself is not a very exciting city: Apart from hanging out at the Parque de los Novios in the evenings, which however is really nice, there is not much the city itself has to offer. 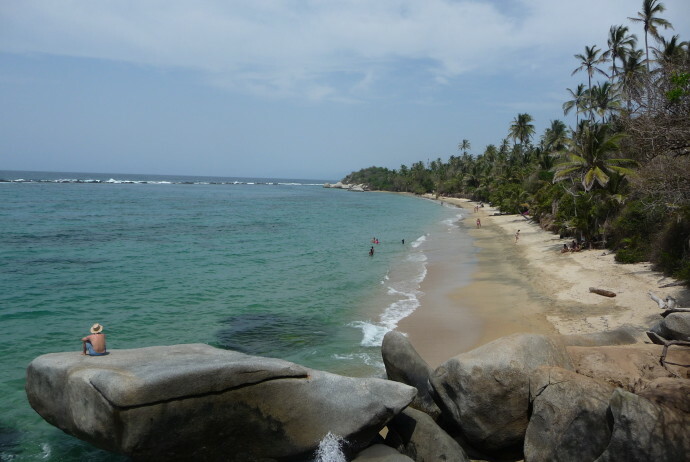 BUT, close by awaits National Park Tayrona, and that is a real highlight of the Colombian Coast. We hiked through tropical rainforest and along perfect beaches until we reached our campsite for the night. There we slept in hammocks and were quite surprised when we woke up with only a few mosquito bites – everyone we had talked to before going there had told us horror stories of how we would basically be eaten alive there by these little bastards. However, as we continued living with an only minor blood loss, and that quite happily, we had some breakfast at the jungle bakery. This place did not look like a bakery in the first place, and definitely not like a trustworthy one, however, it served amazing chocolate bread which was so good, that we could not even have dreamed of any better. So we were even happier after that and went on to enjoy a fun day at the beaches around the area, playing in the water, swimming and relaxing at the shore. Back in Santa Marta we went on to do some more excursions the rest of the days at the coast. One day we went snorkeling at Playa Grande, a bay close to the small and quite charming fishing town of Taganga, just 15 bus minutes outside of Santa Marta. Lots of people get scuba certified here, not only because there is quite a lot to see but also because the diving schools here offer great deals. On our last day we went to check out the beach at Bahia Concha, which turned out to be nice but a bit boring after a while, so we went back to town where we found the probably best ceviche (remember, that is the raw fish dish we have told you about a few times already) place in town, munched lots and lots of ice cream and hung out one last time in the Parque de los Novios, drinking some wine. The next morning it was time to say goodbye to Colombia for Patrick and Nicky as they were headed towards the last big adventure of this South America trip: Venezuela. However, it was also time to say goodbye to each other, as Lisa was staying in Taganga for a few days longer to take the chance to get her diving certification before going home to Europe. What to do: Don’t stay in the cities! Make excursions to see the beaches outside of the cities like Playa Blanca or the ones in Parque National Tayrona – they are the ones everyone is talking about when marveling about the perfect Caribbean beaches in Columbia! Where to sleep: Hostal Casa Candela y Chocolate in Santa Marta is a great choice. Clean and bedbugs free beds plus friendly staff, what else can you wish for? What to eat & drink: Try the fresh Mojarra (with which you were probably still swimming with during the day) at one of the beach restaurants in Playa Blanca – sooooo good!! 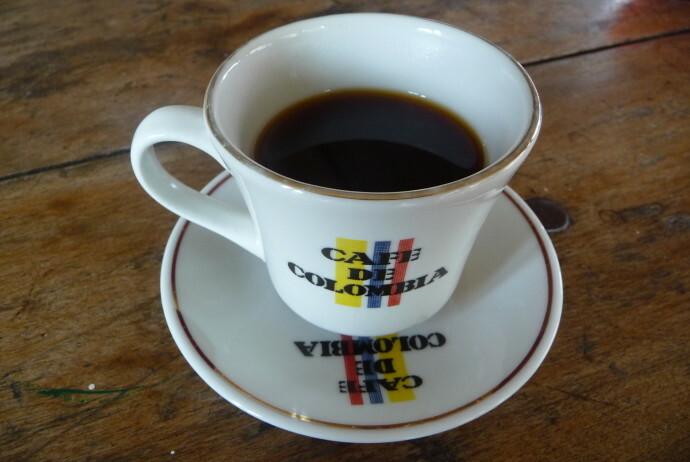 No other country is probably as famous for its coffee as Colombia. Thus, and because everyone that has been there told us how marvelously beautiful it is, we simply had to visit the “eje cafetera”, Colombia’s most important coffee region. An especially scenic place in the area is Salento. This small town is located in the midst of green hills where coffee is cultivated on farms that warmly welcome visitors to show them how coffee beans are grown and transformed into what we can eventually buy in the supermarket back home – notably, back home, as we learned that all the good stuff is exported, whereas only the low quality produce remains in Colombia. Due to that fact, most Colombians prefer hot chocolate for breakfast – no surprise for anyone who has tasted the gray water that is served in most places as coffee around here. However, back to Salento. Already the town itself is totally worth a visit. We strolled around between the narrow but intensely colorful little streets and hiked up to various view points before enjoying a trout, the local specialty, for lunch. Later in the afternoon, we went to visit Don Eduardo’s coffee farm which is one of the smaller ones in the area but focused on organic production. We opted to go there on horseback, as it sounded like a more romantic way to explore our surroundings than a bike ride or a hike. When we got there, the owner, Don Eduardo, welcomed us warmly before our tour started. Afterwards, we could relax for a wile, sipping some freshly roasted and brewed, literally homemade coffee, before mounting our horses again in order to return to town. Another one of Salento’s main attractions is the beautiful Valle de Cocora. Everyone visiting should take a day to go see the breath-taking wax palms that grow up to 60 meters into the sky. To get there, people typically take jeeps to the trailhead from where it takes about five hours to do the whole trail in a pace that allows to enjoy the wonderful scenery. From the smooth and relaxed hills of Salento our journey then went on to the busy streets of Medellín. What to do: Learn how to grow and make coffee at one of the farms around town. For example at the Finca Don Eduardo. Where to stay: You find plenty of hostels in Salento. We stayed at La Casona Hostel Salento. It’s basic but clean. What else does a backpacker need? What to eat & drink: Go to one of the many restaurants that offer trout. You can’t go wrong with that, they all know how to cook it to perfection! 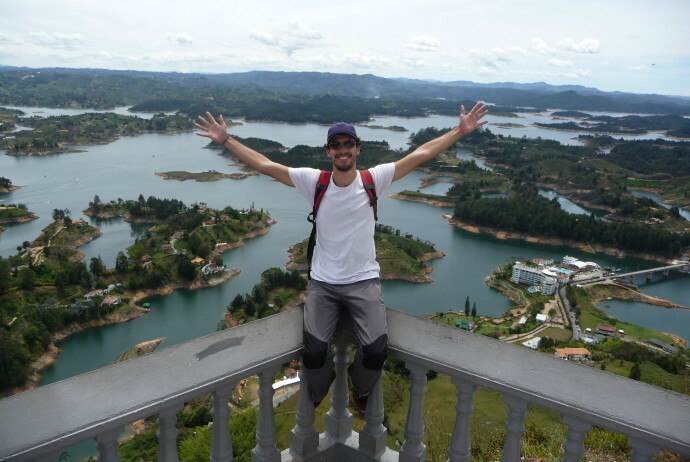 Repeated recommendations of fellow backpackers had eventually convinced to add the extra loop on my itinerary to go visit Medellín, Columbia’s second biggest city. As Lisa and Nicky were already too eager to get to the coast, I was exploring the hometown of the probably most famous gangster of all times, Pablo Escobar, by myself. By the time I eventually made it to my hostel, the initial motivation to explore the city was at the lowest level possible – I just wanted some rest! After a while though, curiosity conquered laziness and off I went to explore! Medellín is located in the Aburrá valley, surrounded by mountains. Way more thrilling then the scenic location, however, is its thrilling history. Back in the day, it was considered as one of the most dangerous cities in the world, mainly due to the activities of Pablo Escobar, the most wanted drug lord of that time who controlled his cartel from Medellín but was feared everywhere. 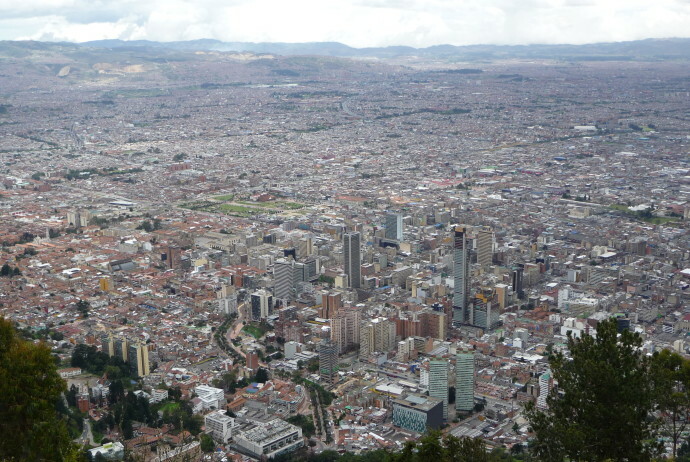 Since he was shot to death in 1993, Medellín, blossomed and is nowadays considered as a highly innovative city. The immense size of Medellín is best visible when taking a cable car to get a bird’s eye perspective from the Santo Domingo barrio. However, to be honest, the view I got there was not altogether so charming and definitely not made me want to see too much of the city close up thereafter. Thus, my city tour was kept to a minimum. Instead I took some time to relax until I went to discover the real beauty of the area which awaits visitors a two hour’s bus ride outside of Medellín, in Guatapé. Guatapé is a little colonial town, but the surrounding in which it is located is breathtaking. It is a huge lake scenery which seems just unreal. Taking away some of the romantic idyll is the fact that it was all artificially built, serving the purpose to feed a hydro-electric dam. Nevertheless, it is still absolutely beautiful! It requires some effort to get to the best viewpoint that is definitively from “La Piedra”, a monolith with a height of 200m. Everyone who climbs the 659 steps and reaches the top is rewarded with a stunning 360° view. While in Guatapé, it is also worthwhile to take a boat tour to enjoy the landscape from a different perspective. Fortunately, my trip to Medellín was on a weekend because then the city offers some of the best parties in all of Colombia. This is at least what other backpackers were telling! And in order to check these rumors, a short visit to Parque Lleras which is supposed to be the city’s party hub was inevitably. Indeed, there are plenty of bars, restaurants, and clubs. But still tired from the hours in the bus, after a few shots of Aguardiente – a liquor that all Colombians seem to love – I desired nothing more than some sleep – in a bed for a change. Where to sleep: La Presidenta is a budget accommodation with a friendly and helpful staff located in the heart of El Poblado, one of the city’s best neighborhoods. Also quite convenient: it is in walking distance to Parque Lleras. Where to eat & drink: In El Poblado you find lots and lots of bars, restaurants and clubs. What to do: Go to Guatapé! It’s only a day trip from Medellín and you surely won’t regret it. If you are in Medellìn for the weekend, visit Parque Lleras. This is Medellíns number one nightlife district and really does have something for everyone’s taste.